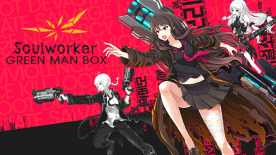 This product requires the base game SoulWorker - Anime Action MMO. With the Green Man Box you’ll fight the demons of the void much more effectively, and get a few fantastic benefits along the way. This stylish accessory for sure makes you 20% cooler at the very least! This level of cool is currently under the radar... if you attempted to gift them to someone else, they’ll likely turn down your offer to be removed from your inventory. This kit gets you 50% more health (HP) and SoulForce (SF). It was designed for overcoming brutal final bosses. You can of course use it against weaker foes and then hit them with your entire SoulWorker strength... overkill! ‘Oh, I, er, tripped for a moment’. For when life beats you up and knocks you down, the Respawner gets you up again! This keycard is magic! Really! Additional rewards will land in your inventory after a dungeon as if they appeared out of thin air. Please click here for instructions on how to redeem your purchase.